"Naphtali is a hind let loose, he gives beautiful words." "...'O Naphtali, satisfied with favor, and full of the blessing of the Lord, take possession of the sea and the south.' "
Of the 12 tribes of Israel, none received land more beautiful than this tribe. Their land has been called the "Garden of Palestine". Their inheritance fell in the region of Galilee. Centered around the shores of the Sea of Galilee, this tribe possessed the most fertile and productive region in all of Canaan. Shepherds and farmers alike found the soil and vegetation of this area extremely fertile, and able to support large flocks and herds. The whole of the land is fed by hidden springs emanating from Mount Herman. This area is well watered by multiple sources; principally the Jordan River, the springs of Mt. Herman, and the Sea of Galilee. Mount Herman is just 39 miles northeast of where the Jordan River runs into the Sea of Galilee. In antiquity, the mountains of Galilee bore the name the Mountains of Naphtali. Their allotment was inherited after the conflict with the Canaanite forces at the Waters of Merom in Joshua 11. Along with this tribe, the tribes of Benjamin, Dan, Issachar, Simeon and Zebulun also received their allotments after this battle. The Biblical description of the allotted land can be found in Joshua 19:32-39. "The sixth lot fell to the sons of Naphtali; to the sons of Naphtali according to their families. And their border was from Heleph, from the oak in Zaanannim and Adami-nekeb and Jabneel, as far as Lakkum; and it ended at the Jordan. Then the border turned westward to Anath-tabor, and proceeded from there to Hukkok; and it reached to Zebulun on the south and touched Asher on the west, and to Judah at the Jordan toward the east." The first three verses identify the tribal borders, starting in the southern portion of the tribal allotment. As can be seen on the map, Heleph has not been positively identified. The tribe's border ran from Heleph, thought to have existed to the north of Mt. Tabor, east towards the "oak in Zaanannim". This same phrase was used to describe the area Sisera, king Jabin of Hazor's military commander, fled to in the engagement with Deborah and Barak found in Judges 4. This landmark was apparently well known in ancient times, and bears similarity to the dwelling of Abraham in Genesis 13:18 at the "oaks of Mamre". Zaanannim's location is not certain. However, based on the geography of the Biblical description of the war with Jabin and Sisera, it would seem this city was to the immediate south - southeast of the Sea of Galilee. This would place the city likely in-between Beth-shemesh and Jabneel. However, it has also been identified as lying north of Mt. Tabor, as indicated on the city map. Wherever the city was located, Naphtali's border stopped at the Jordan River. The description starts with Heleph, and moves eastward, encountering the cities mentioned along the way, until the border reached the Jordan River. From Heleph, the border extended westward to Anath-tabor, a city just north of Mt. Tabor. From here, the border incorporated the village of Hukkok. Hukkok's location is uncertain as well. It is usually identified with the village of Yaquq, lying four miles north of the Sea of Galilee, near Gennesarett. Regardless of Hukkok's exact location, Scripture makes it clear in the following verse the tribe of Naphtali bordered Zebulun on the south, and Asher on the west. The last part of this sentence appears very problematic. The tribe is said to have bordered the tribe of Judah "at the Jordan toward the east". This sentence appears to be completely out of line with the borders of the tribe of Judah, located in the southernmost portions of Canaan, given earlier in Joshua 15:20-32 & 19:1-9. Judah is clearly listed as a tribe of the south. Yet, in this passage, they are said to have dwelt in the northern part of Canaan, and on the east side of the Jordan River! Rabbi Joseph Schwarz offered a very Biblically based solution to this apparent contradiction in Scripture. His solution can be found at www.jewish-history.com/palestine/naphtali.html. In order to understand this reference to the tribe of Judah, two passages must be examined. One is found in Numbers 32:39-42. The second passage is found in I Chronicles 2:21-22. 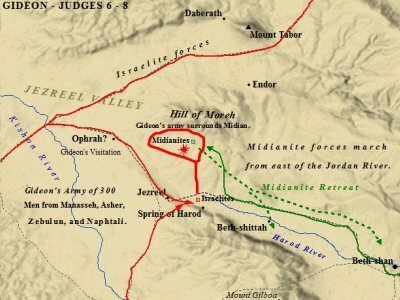 These two passages, when taken in context with the border description of the tribe, provides the explanation for Judah's location in the north, and east of the Jordan. "The descendants of Makir, son of Manasseh, went into Gilead, captured it and drove out the Amorites who were there. So Moses gave Gilead to the Makirites, the descendants of Manasseh, and they settled there. Jair, a descendant of Manasseh, captured their settlements and called them Havvoth Jair." "Afterward Hezron went in to the daughter of Machir the father of Gilead, whom he married when he was sixty years old; and she bore him Segub. And Segub became the father of Jair, who had twenty-three cities in the land of Gilead." The connection to Judah is seen in this verse. Hezron was the son of Perez, found in I Chr. 2:5. Perez was the son bore to Judah and Tamar, found in Genesis 38. Hezron, thus, was of the tribe of Judah. Hezron is said to have taken the daughter of Machir, the same Makir from the passage in Numbers, as his wife. Hezron, thus, appears to have married into money, so to speak. Makir, and his sons, had driven out the kings of Og and Sihon, and the remaining Amorites in the land east of the Jordan. They then took possession of the land of Gilead, east of the Jordan, when Moses granted their request to settle the area. Hezron married into this family by marrying the daughter of Machir. Apparently Hezron, of the tribe of Judah, inherited some of this land as a result of his marriage. Perhaps it was part of the agreement in regards to the marriage. Or, perhaps it was as simple as a father-in-law taking care of his son-in-law and daughter. Jair, their grandson, is said to have had twenty-three cities from the land of Gilead. Scripture is silent as to how the grandson of Hezron inherited land in Gilead. In the Babylonian Talmud: Tractate Baba Bathra, 112a, Jair is said to have taken a wife that died. He, as her husband, was her heir. Though nothing is said Biblically about Jair's wife, he is of mixed tribal descent, which would have played a key role in his inheritance. His grandfather Hezron was of the tribe of Judah, while his grandmother, the daughter of Makir, was of the tribe of Manasseh. Jair, thus, inherits cities, according to the Babylonian Talmud and the Bible, in the land of Manasseh, through his grandmother's line. These cities were located in Gilead, which lie to the east of the Jordan. The family of Jair, however, would have belonged to the tribe of Judah. Tribal membership was based on the father's affiliation. Thus, the tribe of Judah would have possessed land holdings in Gilead, inherited through the marriage of the daughter of Makir and Hezron. In this respect, Judah did own cities in Gilead, east of the Jordan, and north of Judah proper. To the immediate west of Gilead lay the eastern border for the tribe. This, thus, seems to provide a Biblically adequate answer for the apparent contradiction regarding Naphtali bordering Judah. Perhaps the author's intent was not the tribe of Judah's actual inheritance, but, rather, the land owned by the tribe of Judah through Jair, located east of the border. Verses 35-38 list the cities within the tribe. "And the fortified cities were Ziddim, Zer and Hammath, Rakkath and Chinnereth, and Adamah and Ramah and Hazor, and Kedesh and Edrei and En-hazor, and Yiron and Migdal-el, Horem and Beth-anath and Beth-shemesh; nineteen cities with their villages. This was the inheritance of the tribe of the sons of Naphtali according to their families, the cities with their villages." Further description is found in Joshua 21:6,32. 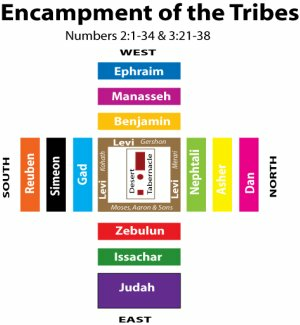 In this passage, Joshua is listing the Levitical cities within the tribe of Naphtali. These cities were given to the Gershonites, the sons of Gershon. Gershon was one of the sons of Aaron, thus his clan became a priestly clan of the Levites. No allotment was given to the Levites, descended from Levi. They were the priestly tribe, set aside for God. As a result, cities from each of the tribes of Israel were given to the Levites to dwell in. "And the sons of Gershon received thirteen cities by lot from the families of the tribe of Issachar and from the tribe of Asher and from the tribe of Naphtali and from the half-tribe of Manasseh in Bashan." Thus, thirteen cities in the north of Canaan were allotted for the Levites from these 4 tribes. 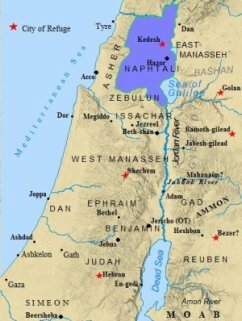 The cities from the tribe of Naphtali are listed in Joshua 21:32. "And from the tribe of Naphtali, they gave Kedesh in Galilee, the city of refuge for the manslayer, with is pasture lands and Hammoth-dor with its pasture lands and Kartan with its pasture lands; three cities." The Gershonites, thus, were limited to settling three cities within these tribal borders. The first mentioned is Kedesh, which was also a City of Refuge. It was here that one guilty of accidental murder could wait safely until trial. The accused was not subject to retaliation by offended family members and friends as long as they stayed in the City of Refuge until the trial. If they ventured from this city, then they were no longer under its protection. The region around Kedesh was known as Galil. Later, this name was given to the whole of the northern region, and became known as Galilee. The other two cities the sons of Gershon inherited were Hammoth-dor and Kartan. Their territory extended about 800 square miles. This tribe, thus, was double the size of Issachar, and the largest of the Northern Tribes. It was the southern portion, surrounding the Sea of Galilee, that earned the nickname, "The Garden of Palestine". This area would also be home to the ministry of Jesus Christ. Many of His parables were taught on the banks of the Sea of Galilee. Many of His miracles also took place within these borders. Interestingly, no border is given in the north. A natural barrier would have been the Litanni River, which emptied into the Mediterranean Sea. The Litanni River effectively separated the kingdom of Tyre from the Northern tribes. However, www.christiananswers.net states the northern boundary extended into the Beqa Valley of Lebanon. The Bible does not state where the northern boundary is, thus, any speculation is just such. As Moses and the Israelites set out on their trek through the wilderness, God gave them strict and detailed instructions as to how they were to pitch camp, break camp, and the marching order as they sojourned to the Promised Land. No detail was left unattended to. The tribe found themselves encamped on the north side of the Tabernacle, under the leadership of their older brother Dan. Their assignment is found in Numbers 2:29. Then comes the tribe of Naphtali, and the leader of the sons of Naphtali; Ahira the son of Enan, and his army, even their numbered men, 53,400." They encamped next to the tribe of Asher. These two tribes fell under the leadership of the tribe of Dan. Together, these three tribes secured the rear of Israel as they marched. The rear guard was, perhaps, the most critical position. These three tribes were responsible for ensuring the tribes of Israel were not surprise attacked from the rear. As they marched, the tribes would have been vulnerable to attack. The fiercest of warriors, and toughest of warriors, were primarily placed in the rear guard, in order to prevent a devastating rear attack. Numbers 10:25-27 depicts the 12 tribes of Israel breaking camp, and leaving Mt. Sinai. "Then the standard of the camp of the sons of Dan, according to their armies, which formed the rear guard for all the camps, set out, with Ahiezer the son of Ammishaddai over its army...and Ahira the son of Enan over the tribal army of Naphtali." These tribes, thus, were the last to break camp, and likely the last to pitch camp. They were exposed during the march, and depended upon to prevent surprise attack. These men would prove to be an able and effective tribe during battle. Numbers 1:15 lists the leader of the tribal army. This man is said to have been Ahira, the son of Enan. This man would have been their commander, the one responsible for alerting the tribe when to pitch camp, and break camp. He would have led the army in battle. God hand picked these men, and gave their names to Moses. These men, according to the word of the Lord to Moses, "are the names of the men who shall stand with you". Naphtali was the sixth son of Jacob, born to him by Rachel's handmaiden Bilhah. He was the biological younger brother of Dan. As the first four sons born to Jacob came from Leah, it seems likely these two were much closer to each other than they were to their other half-brothers. This, of course, is not stated in Scripture, and is pure speculation. His birth is recorded in Genesis 30:7-8, and seems to hint at an intense rivalry which existed between Rachel and Leah. "And Rachel's maid Bilhah conceived again and bore Jacob a second son. So Rachel said, 'With mighty wrestlings I have wrestled with my sister, and I have indeed prevailed. And she named him Naphtali." The name, thus, means, "to obtain by wrestling". The Hebrew word is derived from a root, pathal, which means to twist, cunning, crooked, show yourself astute, wrestled. It is important to remember Jacob loved Rachel first, as she was the one he originally intended to marry. However, Laban deceived Jacob, and gave him Leah instead. As women wore veils over their face during the wedding ceremony, and into the night, Jacob was unaware of Leah's identity until the next morning. Scripture is silent as to the whereabouts of Rachel, but it would seem natural she was not in favor of the plot. However, it is important to keep in mind Scripture makes no such reference to Rachel's feelings throughout this episode. In any respect, the situation had the makings of a potential disaster. It must be kept in mind that Scripture does not divulge any details concerning Rachel and Leah's relationship outside of this verse. However, this verse makes it clear things were not good between the two sisters. The Hebrew word translated in this verse as "mighty" is actually the word Elohim. This is one of the names of God used in the Old Testament, and translates as "God", "god", "divine", "mighty". With this in mind, the implication seems to be of a godly struggle. The NASB Bible lists this phrase as also being rendered, "wrestlings of God". One must tread carefully at this point. The struggle between Rachel and Leah is never fully revealed in Scripture. One naturally assumes Rachel was not happy with the actions taken by her father and older sister, though this is an assumption not backed by the Biblical evidence. It is also noteworthy that Leah was the most fertile and productive of the sisters. This, too, would have naturally lead to a feeling of resentment and jealousy on Rachel's part towards her sister. Verse one in chapter 30 of Genesis hints at Rachel's anger and jealousy towards her sister. In this verse her anger manifests itself at Jacob, who responded in like fashion back at Rachel. Thus, Rachel is depicted as undergoing an intense struggle with jealousy, anger, resentment; a product of her lack of children and Leah's fertility, and perhaps a lingering feeling of injustice over Leah marrying Jacob. Rachel, it would seem, took her pain and feelings of frustration to God. Perhaps she pleaded for a child, and pleaded to God for justice. Whatever her "mighty wrestlings" were, the birth of Naphtali was the answer to her prayers. Perhaps, Rachel had blamed God, initially, and struggled to come to grips with the reality of the situation. It would seem at some point, she overcame these feelings, and rather than struggle against God, perhaps she struggled with God, leaning on Him for strength. God rewarded Rachel with Naphtali, and she commemorated her struggle with his name. Naphtali is absent throughout the Biblical narrative. No events involving him are given. However, there are clues as to his character, and the type of person he was. Perhaps the biggest clue into the nature of Naphtali can be found in Jacob's Blessing. He was not named specifically in the narrative concerning Joseph. However, his silence is evidence he went along with the plot to initially kill Joseph. The only son of Jacob that stood up to the original plan to kill Joseph was Reuben. He convinced the brothers to sell Joseph, rather than murder him. After casting Joseph into a pit, Scripture relates the brothers "sat down to eat a meal". It was at this point that Judah made the proposition to sell Joseph to a caravan of Ishmaelites on their way to Egypt. Naphtali, along with the other brothers, simply went along. However, Scripture gives evidence that he was a good and righteous man. Jacob states that he "gives beautiful words" in the blessings of his sons. The Hebrew word translated as "words" is "Emer". This Hebrew word translates as "speech", "arguments", "sayings", "utterances". Emer occurs fifty times in the Old Testament, mainly in the books of Psalms, Proverbs, and Job. These books are full of sayings, quotes, and anecdotes to live by. The book of Job is littered with speeches by various individuals. Emer is derived from the Hebrew word Amar. This word translates as "to tell", "to speak", "to utter". It is used over 5,000 times in the Old Testament. The general idea, according to Spiros Zodhiates, "is the uttering of some type of spoken word". Amar occurs eight times in Genesis 1, and is used specifically by God to speak the world into existence. Based on these two Hebrew words, and the context "emer" is used in relation to Naphtali, Jacob seemed to be saying that his son gave good, sound, godly advice. He possessed eloquent speech, a sign of high intelligence. This son of Jacob, it would appear, became known for his eloquent speech and sage advice. He must have been a well respected man by his peers, as he certainly was by his father. Whatever his misdoings were in his youth, by the time Jacob was ready to die, he had become a godly man, a man of righteousness and "beautiful words". This sentiment is echoed by Moses in his blessings of the tribes, found in Deuteronomy 33. In this passage, Moses credits the tribe as being "satisfied with favor, and full of the blessing of the Lord". Each of the 12 sons of Jacob followed in the prophetic utterance of their father. In many cases, the tone and sound of Jacob's Blessing is echoed by Moses when he addresses that particular tribe. This is the case with Naphtali. His righteousness and godliness was mirrored by his tribe. Moses declares they were fully blessed by the Lord. God does not find favor with those who do not strive after Him. Thus, it is quite evident there was something special about this tribe. This trait was a product of the heart, character, and nature of the son Naphtali. The last mention of Jacob's son takes place in Genesis 46:24. This chapter lists the names of Jacob's family which accompanied him into Egypt. The sons of Naphtali are given in this verse. They are; Jahzeel, Guni, Jezer, and Shillem. I Chronicles 7:13 lists Jahzeel as Jahziel. Shillem is known in some Hebrew and Septuagint manuscripts as Shallum. Numbers 1:42-43 lists the men of Naphtali twenty years old or more, "whoever was able to go out to war". This is the first census taken by Moses upon leaving Egypt. The opening verses of Numbers 1 relates how, in the second year of their wandering, the Lord spoke to Moses ordering him to take a count of the fighting men of Israel. "Of the sons of Naphtali, their genealogical registration by their families, by their father's households, according to the number of names, from twenty years old and upward, whoever was able to go out to war, their numbered men, of the tribe of Naphtali, were 53,400." This was the sixth largest number of fighting men amongst the 12 tribes of Israel. However, the tribe lost men in the desert wandering. It was after the first census that the Almighty relayed His instructions to Moses concerning the encampment of Israel in the wilderness. This particular tribe, as stated above, was assigned to the camp of Dan, along with the tribe of Asher. These three tribes were to protect the rear of the advancing camp. Numbers 26 is the second census taken by Moses. This census was taken as the Israelites prepared for the conquest of Canaan. This passage lists the families of each son of Jacob as well. "The sons of Naphtali according to their families; of Jahzeel, the family of the Jahzeelites; of Guni, the family of the Gunites; of Jezer, the family of the Jezerites; of Shillem, the family of the Shillemites. These are the families of Naphtali according to their families; and those who were numbered of them were 45,400." The tribe had lost 8,000 men throughout their sojourn in the wilderness. After the second census, they had slipped to the eighth largest tribe of the tribes of Israel. No reason is given in Scripture as to why they lost so many men. However, it would not be illogical to make the assumption their position as the rear guard may have had something to do with this. As the Israelites advanced into Canaan, it quickly becomes evident the tribe is known for their fierceness in battle. They were a tribe of warriors, swift and efficient in battle, like a "hind let loose", to quote the words of Jacob's Blessing. Though their land was extremely fertile and productive, and able to support large herds, it's location in the north of Canaan opened it up to outside threats and influences. This was a tribe surrounded by a circle of nations. Immediately to the north lie Syria. To the northwest were the Phoenicians, centered in Tyre and Sidon. Immediately to the north and northeast lay Aram-Damascus, always a threat to ancient Israel. To the east, east of the Jordan, was Bashan, former kingdom of the giant Rephaim king Og. The tribal allotment lay at the northern doorway into Canaan. This fact, coupled with its proximity to Mesopotamia, made it vulnerable to armies on the attack. Indeed, the men of Naphtali were heavily involved in the Northern campaign of Joshua's Conquest. Judges 1:33 provides Scripture's first reference of Naphtali in a time of war. "Naphtali did not drive out the inhabitants of Beth-shemesh, or the inhabitants of Beth-anath, but lived among the Canaanites, the inhabitants of the land; and the inhabitants of Beth-shemesh and Beth-anath became forced labor for them." Even though these men failed to completely drive out the Canaanites, they subjected them to forced labor. Thus, they maintained autonomy in their land while living amongst the Canaanites. It was clear they exerted a degree of control over the majority of their inheritance, although it was not outright. Scripture makes it clear the Israelites failed to conquer the fortress cities of Jokneam, Megiddo, Taanach, Beth-shan, amongst others (Joshua 17). Though the Northern Tribes appeared to maintain a certain degree of authority in the north of Canaan, it was not unchallenged. They were often engaged in conflict with the Canaanite forces of northern Palestine, as well as with forces from nations east of the Jordan River. 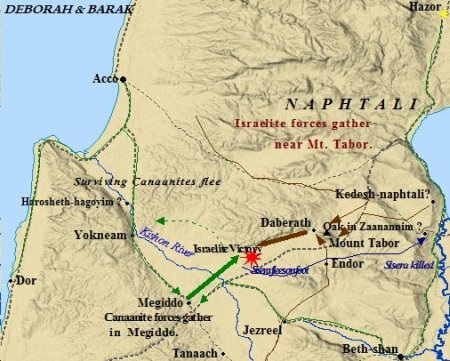 The first major engagement the tribe participated in was likely the Battle at the Waters of Merom, described in Joshua 11. This was the major engagement of the Northern Campaign. Scripture does not list specifically the tribes of Israel involved in this conflict. However, it is highly likely that at least the tribes of Asher, Naphtali, Issachar, and Manasseh were involved. The primary reason for this assumption, rests in the fact that these tribes inherited the land involved in this battle. Scripture indicates that each tribe was involved in the disputes which would later encompass its territory. The Battle at the Waters of Merom was a major engagement. Jabin, the king of Hazor, was the head of the Canaanite alliance. Jabin is also mentioned as the king of Hazor in the battle with Deborah and Barak, which would have happened significantly later. A reasonable explanation can be found in the titles of Abemilech, Pharoah, Caesar, and other such titles for kings. It is likely that Jabin was the title given to the main leader of the Canaanite city-states. The fact Jabin is said to be king of Hazor strengthens the argument in favor of Jabin as a kingly title. Hazor has been recognized as the chief of the Canaanite kingdoms in the time before Joshua. It was the largest, and one of the most important Canaanite city-states. Documents unearthed at Mari, and dating to 1850 B.C., make mention of Hazor being a major commercial center. Hazor was heavily involved in the ancient tin trade, vital for making bronze. The city rested just nine miles north of the Sea of Galilee. It sat on the spot where the International Trade Route crossed the Jordan, making it a very important and strategic city. Egyptian documents also make mention of Hazor, starting around 2000 B.C. Hazor reached its zenith in the time of the Amarna Letters , around 1300 B.C. These texts make mention of Hazor's king Abdi-tirshi. This is another indication of Hazor's prominence in Canaan. Canaanite rulers seldom used the word "king" to describe themselves. Interestingly, archaeology has shown that the Upper and Lower cities of Hazor were destroyed in a violent conflagration shortly before 1200 B.C. Many Biblical scholars take this to represent the destruction imposed on Hazor by Joshua. Indeed, this evidence corroborates the Bible's description of the Battle at the Waters of Merom. King Jabin had summoned Jobab, king of Madon, along with the king of Shimron, and the king of Achshaph. Along with these, the Bible tells that the Canaanite "on the east and on the west" answered Jabin's rallying call. Amorites, Perizzites, Jebusites, and Hivites all joined forces against the invading Israelite army. Joshua 11 relates the coalition encamped at the waters of Merom, in the north of Canaan. Despite the overwhelming odds, God reassured Joshua that He would deliver the enemy. In verse 4, the Israelites were said to have come "upon them suddenly by the waters of Merom, and attacked them." Once again the words of Jacob come to mind in regards to Naphtali. "Naphtali is a hind let loose..."
Perhaps the tribe led the swift and sudden charge against the combined Canaanite forces, though Scripture does not give much detail concerning the attack. After pursuing some of the Canaanites to the Valley of Mizpeh, Joshua turned around and led the Israelites back to Hazor, where they burned the city to the ground. The Bible also states, in verse 10, that "Hazor was formerly the head of all these kingdoms." Thus, the Bible is backed up by two points in this narrative thanks to archaeology. The first point, that Hazor sat at the head of the Canaanite city-states, has been well documented by multiple sources from various nations. The second point rests in the archaeological evidence of the violent conflagration that brought an end to Hazor. This is clearly stated in Joshua 11:11. "And he burned Hazor with fire." This victory opened the door for the tribes of the north. The land in question fell to the tribe of Naphtali, perhaps another clue as to their primary involvement in the struggle. Joshua 13 begins the division of the conquered land to the tribes of Naphtali, Zebulun, Issachar, and Asher. Naphtali is involved in another major battle found in Judges 4. The Israelites became oppressed by Jabin, king of Hazor. As staed above, Jabin was probably a name given to the king of Hazor. Scripture tells us his commander was Sisera, who lived in Harosheth-hagoyim. Scripture records Jabin "oppressed the sons of Israel severely for twenty years". In this instance, the tribe of Naphtali is specifically mentioned as one of two tribes primarily involved in this conflict. In verse 7 God assured Barak He would draw out Sisera and his army, and deliver them to the Israelites. The battle would take place near the Kishon River, in the Jezreel Valley. This was the location of many battles throughout the ages. Megiddo was a Canaanite stronghold, and a very strategic city, as it controlled the Jezreel Valley, and access into the heartland of Canaan. It is in this exact spot that John envisioned the battle of Armageddon taking place in Revelation. Despite Barak's hesitancy to follow God's command alone, and the diminished glory he would receive as a result, the New Testament book of Hebrews lists Barak as a hero of faith. Hebrews 11 lists a number of Old Testament personalities exemplified because of their faith. The passage concerning Barak can be found in 11:32-34. This thought was surely in the back of every Israelite warriors mind. Nevertheless, Barak and Deborah proceeded as God had instructed, for they had seen God's deliverance despite overwhelming odds against them. Verse ten states that Barak called together the men of Naphtali and Zebulun, the nucleus of the invading Israelite forces. However, the Song of Deborah, which commemorated the Battle at Hazor, listed contingencies from other tribes as well which participated. Warriors from the tribes of Issachar, Ephraim, and Benjamin, as well as men from Makir, joined in the fray. Interestingly, the Song of Deborah is critical of a few tribes which chose not to participate. Deborah was critical of the tribes of Reuben, the tribes from Gilead, and the tribe of Dan. These tribes violated Moses' order to help with the Northern Conquest. This order of Moses' can be found in Numbers 32:20, when Moses is addressing the elders of the Transjordanian Tribes which sought land east of the Jordan, in the former kingdoms of Og and Sihon. "Then Moses said to them, 'If you will do this - if you will arm yourselves before the Lord for battle, and if all of you will go armed over the Jordan before the Lord until he has driven his enemies out before him - then when the land is subdued before the Lord, you may return and be free from your obligation to the Lord and to Israel. And this land will be your possession before the Lord." The men of Naphtali and Zebulun, as well as the other soldiers, under the command of Barak and Deborah, gathered at Mount Tabor for the impending battle. In order to meet this provocation, Sisera moved his forces out from Harosheth-hagoyim, and gathered together at Megiddo, the Canaanite stronghold in the region. Thus began the battle, with the men of this tribe along with men from Zebulun composing the majority of the forces. The recent rains neutralized the Canaanite chariot division, and they were routed by the Israelites. Barak and his men drove the Canaanites "as far as Harosheth-hagoyim". This verse seems to imply the Kishon had flooded, as stated above, and the chariots were washed away, rendered useless in the muddy terrain. It would seem God had planned this battle in conjunction with rain! What an amazing picture of God using His creation to accomplish His purposes. Scripture relates Sisera fled on foot, apparently losing or abandoning his chariot, probably the latter due to their inability to navigate the swampy plain. He fled to a nearby residence owned by a man named Heber, the Kenite, and his wife Jael. Scripture relates these people had separated themselves from the Kenites, and settled near the oak in Zaanannim. Verse 17 states there was peace between Jabin, king of Hazor, and the house of Heber the Kenite. Though Scripture does not divulge any details into what sort of peace existed, the implication seems to be Heber had abandoned his Israelite brethren, perhaps choosing to side with the foreign king of Hazor. This was a great victory for the men of Naphtali, and all of Israel. Naphtali's bravery is recorded in Judges 5:18. "Zebulun was a people who despised their lives even to death, and Naphtali also, on the high places of the field." This is a particularly illuminating passage into the nature of these men. They despised their lives, meaning they would fight to the death for Israel and God. Not only this, but they fought on the high places of the battle field. The high places would have been where the fighting was most intense. Whereas some may shrink from the heat of the battle, this tribe sought out the heat of the battle. They engaged in the fiercest and most intense battles raging. They sought out the high places of the field, knowing the battle would be most fierce there. The men of Naphtali, thus, earned their reputation as fierce and courageous warriors. However, this would not be the only conflict Naphtali would engage in. Immediately following this triumph in Scripture is the oppression by the Midianites, found in Judges 6. The sons of Israel did evil, again, in the sight of the Lord. For seven years, consequently, the Midianites, along with the Amalekites and the "sons of the East", inflicted Israel. This becomes a common theme throughout the Old Testament. The Israelites would stray from God, He would deliver them into the hands of foreign oppressors, the Israelites would cry to God, repent, and God would send a man to deliver them. God's faithfulness is exhibited time and time again. He simply seeks men that will follow Him, trust Him, and exhibit faith in His might. The Israelites had fallen away from God, thus He sent the Midianites and Amalekites to oppress His people. The nature of their oppression is given in Judges 6:3-4. "For it was when Israel had sown, that the Midianites would come up with the Amalekites and the sons of the east and go against them. So they would camp against them and destroy the produce of the earth as far as Gaza, and leave no sustenance in Israel as well as no sheep, ox, or donkey." The Midianites would wait until the fields were ready for harvest, and then descend upon them, destroying the food supplies of Israel. These invaders also killed the domesticated animals necessary for agriculture and meat. In this respect, the Midianites were destroying the very fabric of Israelite civilization. They were striking at the heart of Israel's ability to support itself. God instructed Gideon to tear down the altar of Baal, and cut down the Asherah which stood beside it. Gideon, taking ten of his servants, did this during the night (Jdg. 6:27). The following morning, the men of the city became enraged at the sight of their toppled altar. Scripture then records in verse 3 that the invading army "crossed over and camped in the valley of Jezreel." The allusion to crossing over probably meant that the army crossed the Jordan River, as they were settled in the land east of the Jordan. Upon crossing the Jordan River, the army sets camp in the Jezreel Valley. Once again this valley would play host to a major battle. Through a series of tests the Lord instructed Gideon to give to his army, God chiseled Gideon's forces down to 300 men. What tribe, or tribes, these men belonged to is not given. However, it is not presumptuous, based on the Biblical evidence thus far, to suggest the tribes of Zebulun and Naphtali probably made up the majority of the men. Again, this is purely theoretical, as the Bible itself is silent about such matters. Gideon then encircled the Midianite encampment, staggering his lines to create the illusion many more men were involved than a mere 300. At his instruction, the men smashed their pitchers and blasted their trumpets. With the torch in their left hand, and the trumpet in their right, the Israelite forces must have surely created a sense of shock and awe to the encircled Midianite army. This did not deter Gideon. He summoned the men of Naphtali, Asher and all Manasseh to pursue these two leaders. Oreb and Zeeb were captured by Israel, and beheaded. Scripture records the Israelites brought the heads of these two leaders to Gideon (Jdg. 7:25), effectively ending the oppression. Once again the men of Naphtali appear in a major Israelite battle, and once again the Israelites prove the victors. It is important to note also that Gideon chose men from Naphtali to pursue the two Midian leaders. This indicates a great degree of trust in their fighting ability. It is evident the tribe played a hugely significant role in the conquest of the north of Canaan. Naphtali also played a key role during the era of the Judges. The Battle at the Waters of Merom, and the Battle of Hazor with Barak, are two of the most important Israelite victories in the Old Testament. The tribe of Naphtali was a key component in both. Throughout the annals of the Old Testament numerous men of the tribe of Naphtali are mentioned. The first man mentioned in the Bible from the tribe of Naphtali is Ahira, the son of Enan, mentioned above. Numbers 1:15 states Ahira was to be the leader of the tribe of Naphtali. Scripture states in verse sixteen these men were "called of the congregation". These men, one from each tribe, were the "leaders of their fathers' tribes, they were the heads of divisions of Israel". The second chapter of the book of Numbers lists the army of Ahira at 53,400 men strong. Ahira was also the man responsible for the offering from Naphtali at the dedication of the Tabernacle in Numbers 7. In Numbers 13, the Lord is instructing Moses on who shall be the spies to search out the land of Canaan. Nahbi, the son of Vophsi was to represent the tribe of Naphtali. He would have been among the spies that shrank from the inhabitants of Canaan. In Numbers 35, God has instructed Moses on who shall be chosen to apportion the land to each of the 12 tribes of Israel. One man from each tribe was to be responsible for this. From the tribe of Naphtali, Pedahel the son of Ammihud was chosen. Nothing further is said about this man in the Bible. The tribe of Naphtali played an important role in the narrative concerning king David. I Chronicles 12 depicts David's coronation. All of his supporters gathered at Hebron. The three largest contingents in this passage are from the tribes of Zebulun (50,000), Asher (40,000), and Naphtali. Naphtali is unique in this particular passage in the description of their contribution to David. Not only did they provide 37,000 troops for king David, but Scripture also records they brought 1,000 captains as well. This further illuminates the warrior-nature of Naphtali. They were fierce warriors, led by extremely capable and valiant captains. The only other mention of captains being provided is in reference to Zadok. Of the house of the father of Zadok only twenty-two captains are said to have been brought. Thus it is evident the tribe of Naphtali was highly regarded in the skill of combat. Their fierce warriors were a result of their capable and efficient captains. Further more, Naphtali is one of the tribes mentioned as bringing supplies and food to the national feast, which lasted for three days. Scripture records the tribes of Israel, "even as far as Issachar and Zebulun and Naphtali" brought donkeys, camels, mules and oxen. Along with the animals, great quantities of flour cakes, fig cakes, raisins, wine, oil, and sheep were provided by the people for David's coronation feast and celebration. I Chronicles 27 lists the administration of David's government. The Chief Officer for the tribe of Naphtali was Jeremoth, the son of Azriel. Not only did Naphtali figure in during the reign of David, but they held a unique position during the reign of Solomon. I Kings 7 mentions a special man of the tribe of Naphtali. Solomon, in his quest to build God's Temple, sought the assistance of his friendly allies the Phoenicians. Two chapters earlier Scripture records how Solomon and king Hiram of Tyre befriended each other. Indeed, the Israelites and Phoenicians enjoyed friendly relations during the reign of David, and this would continue under David's son Solomon. As a result of Solomon and Hiram joining forces, the Phoenicians supplied the Israelites with much needed labor and resources. King Solomon's naval fleet was supplied by the Phoenicians. I Kings 7:13-14 names a man from Tyre that Solomon brought to Jerusalem with a specific purpose in mind. "Now king Solomon sent and brought Hiram from Tyre. HE was a widow's son from the tribe of Naphtali, and his father was a man of Tyre, a worker in bronze; and he was filled with wisdom and understanding and skill for doing any work in bronze. So he came to king Solomon and performed all his work." This was not king Hiram, but a different man. This man's mother was a Hebrew woman from the tribe of Naphtali. His father was a Phoenician, it would seem, from Tyre. This provides further evidence of the connection with the Israelites and the Phoenicians. Hiram's father had died at some point, thus he was considered an Israelite, from the tribe of Naphtali. This man possessed a great degree of skill in working with bronze. Solomon brought this man in specifically to work on the Temple. Scripture records he fashioned pillars and capitals for the Temple, as well as the sea of cast metal. Hiram was a very skilled laborer, and a faithful representative of the tribe of Naphtali. Scripture's description of Hiram as being filled with wisdom and understanding echoes the sentiments of Jacob and Moses in their blessings of Naphtali. Jacob claimed Naphtali was full of "beautiful words". Moses likewise claimed Naphtali was "satisfied with favor, and full of the blessing of the Lord". When the United Monarchy split into two kingdoms, Naphtali was a part of the Northern Kingdom of Israel. 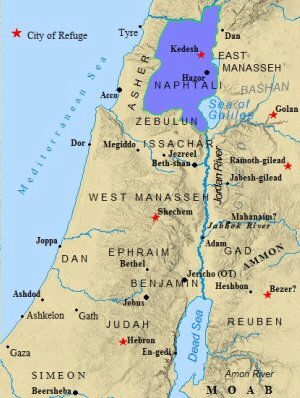 Naphtali became known as a border territory, along with Asher and Dan . These tribes existed on the fringes of Israelite society in the north. They were a crossroads for the nations. These tribes became a cosmopolitan mix of people and religion. Ancient roads and trade routes dissected the land. Traveling caravans from Mesopotamia and beyond traversed this region. Their location in the northern extremity somewhat isolated them from the other tribes of Israel. As a result, the heartland of the Northern Kingdom was in Manasseh and Ephraim. Naphtali was extremely vulnerable to foreign threat and influence. To the immediate north lie Syria. The Phoenicians were to the immediate northwest, in Tyre and Sidon. 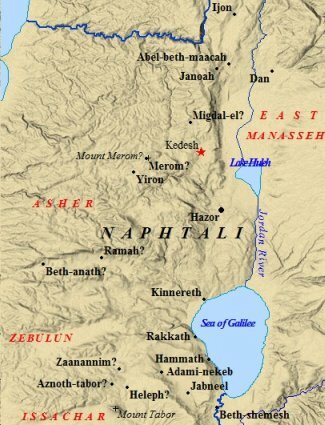 The kingdom of Aram-Damascus was to the immediate northeast of Naphtali. The tribe was located close to northwest Mesopotamia, thus exposed to the foreign armies of the east, often with conquest in mind. They were subject to foreign influences and religions, exposed and vulnerable from the north, southeast, and the east. With the crumbling of the United Monarchy upon the death of Solomon, these northern border territories found themselves in an even more precarious situation. Not only did they face foreign intrusion from the north and east, but now they faced the possibility of civil war from the south by the Southern Kingdom of Judah. Just such an occurrence takes place in I Kings 15. At this stage of the Divided Monarchy, Baasha was ruling the Northern Kingdom of Israel, while Asa was ruling the Southern Kingdom of Judah. Baasha had ascended to the northern throne, according to Michael Grant, in 906 B.C. Asa had ascended to the southern throne two years earlier, in 908 B.C. Scripture states that there was war between these two kings in I Kings 15:16. "Now there was war between Asa and Baasha king of Israel all their days." Baasha did "evil in the sight of the Lord" during his twenty-four year reign. In an attempt to thwart Asa, Baasha "went up against Judah and fortified Ramah". Asa immediately sensed the danger in this endeavor by his northern counterpart. Asa then is recorded as having took all the silver and the gold in the Lord's treasury and used it as a bribe to Ben-hadad I, king of Aram. Ben-hadad was headquartered in Damascus. Asa entreats Ben-hadad to wage war against Israel, in an effort to retaliate for Baasha's fortification of Ramah. Ben-hadad agreed. In verse 20, Ben-hadad is said to have conquered the cities of Ijon, Dan, Abel-beth-maacah, all of Chinneroth, as well as "all the land of Naphtali". This would be a foreshadowing of events to come. Between the years 745 - 727 B.C., Tiglath-pileser III was king of Assyria. The Assyrian war machine was unstoppable. Between the years 734-732 B.C. the Assyrian king conducted numerous campaigns into Palestine. These campaigns severely weakened not only Naphtali, but all of the kingdom of Israel. II Kings 15:29 sheds light on the fate of the Northern Kingdom. Thus, in 732 B.C., the Northern Kingdom of Israel fell to the Assyrians. The people were deported to Halah, Habor, Hara, the river of Gozan (I Chr. 5:26), and the cities of the Medes (II Kgs. 18:11). Consequently, the Northern Tribes of Israel are today known as the Lost Tribes of Israel. The tribe of Naphtali figures in prominently to the history of Israel. This tribe followed in the footsteps of its founder, the sixth son of Jacob, Naphtali. As he was a godly man, so was his tribe. However, they eventually fell into apostasy, as did the other tribes of the Northern Kingdom. Naphtali left an imprint on the Old Testament through their exploits on the battle field. They were praised by Deborah in the Song of Deborah. They provided one of the major workers on the Temple. Naphtali produced officials in both the courts of David and Solomon. Despite their later falling away from God, the tribe of Naphtali was blessed by God. They are one of nine tribes of Israel which appear in all lists of the 12 tribes of Israel. They are mentioned in the only New Testament list of the tribes, found in Revelation 7. In the final days of God's judgement, the tribe of Naphtali will produce 12,000 people sealed on the forehead as servants of God.